Only one thing now stands between the Sorcerer King and the destruction of the world: you. You are faced with a choice: you can raise an army and rise up against the Sorcerer King, defeat his lieutenants, and storm his keep. Destroying him will bring an age of peace to the world. Or, you can race against the Sorcerer King and steal the shards out from under him. Destroying the shards would give you the power to cast the spell to end the world - and ascend to Godhood yourself. Which will you choose? 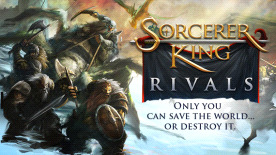 Rivals has two new playable factions complete with new sovereigns, spells, units, and abilities to add to variety of play. Three new lieutenants join the roster of enemies who might be guarding the Sorcerer King's lair, each with new and unique abilities to challenge even the most hearty of champions. A new quest editor and Steam Workshop support allows you to write your own epic quest lines and share them with players around the world. Ascension Victory - Learn the Spell of Ascendancy and consume the shards before the Sorcerer King gets to them first. Amass ascension points to become a god before the Sorcerer King casts his spell, and win the game. New Factions - Turn the land into frozen mountainsides and enhance your warriors as Bazzal the Dwarven King, Sovereign of the Frozen Realm faction or collect bone fragments from vanquished foes and raise armies of the undead with Valemor the Archmage, Sovereign of the Necromancer faction. New Lieutenants - Three new lieutenants of the Sorcerer King wait to challenge you! Two lieutenants out of the list of five will appear randomly every game to oppose you. Face down against the Shadow Dragon Nabunihr, test your might against the Crystal Serpent Abeix, or train your bows on the great bird, Corvos, Bringer of Storms. New Quests - Experience brand new adventure by embarking on never-before-seen quest lines! Enjoy the witty writing and light humor in the face of the world's destruction as you gather unique ingredients and recipes to craft better weapons and armor for your army. Quest Editor - Become the author of your own adventures with this user-friendly quest editor! Write the quest text, craft your decisions, and decide on the rewards. Your quest will automatically become part of the game when saved. Steam Workshop Support - Tightly integrated workshop support lets you easily share your creations with the rest of the world! Download maps and quests created by others and explore all of the new possibilities for adventure. The Sorcerer King - This is not a fair fight. He has powerful lieutenants guarding his keep and scores of sinister monsters in his dark army. Maintain diplomatic relations with other factions, raise your army, and then rally them all to your cause against the Sorcerer King. Doomsday Counter - Your time to put down the Sorcerer King is limited. You must either storm his keep and destroy him, or take all of the shards' essence for your own before he gets to them first. If the counter fills up and the Sorcerer King completes his spell, your world is doomed. Unique Leaders - Choose from 8 different Sovereigns, each with their own unique sets of skills and abilities. Try all of them and experiment with different styles of gameplay to find what strategies work best for you. Crafting and Enchanting - Discover recipes for powerful artifacts and armor through quests and craft them with the Forge of the Overlord. Then, imbue them with magical properties to give your forces an advantage against their enemies. Adventures Abound - Hundred of unique, individually written questlines bring a touch of humor to the impending doom of the apocalypse. You can also use the new quest editor to write your own incredible adventures, then share them with others on the Steam Workshop. Fierce Adversaries - The remains of once-powerful civilizations cling to life in the Sorcerer King's realm, but they can't win alone. Ally with them and gain their favor to earn the aid of their champion... or, wipe them out and claim their lands and treasures for yourself.